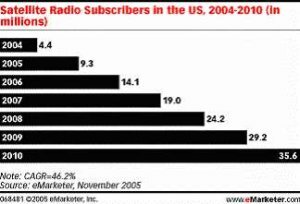 NEW YORK, NY -- (MARKET WIRE) -- December 1, 2005 -- The battle for satellite radio subscribers in the US is rapidly escalating, according to a new eMarketer report. "The $500 million question is, of course, what Howard Stern's move to satellite radio will mean for his show, for Sirius and for satellite radio in general," says Krikor Daglian, Editor and Analyst at eMarketer and author of the Satellite Radio report. eMarketer estimates that 35.6 million Americans will subscribe to a satellite radio service by 2010, up from 9.3 million in 2005. At the end of the third quarter of 2005, XM had over five million subscribers, up from 2.52 million a year earlier. Sirius had 2.17 million subscribers, up from 660,000 a year earlier. "Stern has enjoyed a long run-up period -- and he has used the time to hype his satellite show on his terrestrial show," said Mr. Daglian. "He also has the advantage of moving right in the holiday season, allowing Sirius radios and subscriptions to become gift items." eMarketer estimates that the Howard Stern factor and the traditional boost from holiday shopping will give Sirius over 3.2 million subscribers by the end of 2005. Despite Sirius growing more quickly over the period, XM is expected to maintain its lead over its rival. eMarketer's estimate is based on previous growth rates for the two firms and the experience of similar consumer technology adoption trends (such as broadband and Internet access), which achieve quick expansion over the first few years and then settle down to steady growth. "Howard Stern is not the first big-name radio host to make the jump from terrestrial radio to satellite radio, but as the star of one of the country's highest-rated morning shows, he is the biggest radio personality to make the journey," says Mr. Daglian. "And the success or failure of satellite radio could be riding on how he lands." --  Who is listening to satellite radio? and the overall satellite market? --  What challenges do satellite radio providers face?